So if you’ve read my post on Fro Fashion Week, then you should already know I was able to take home some hair products. 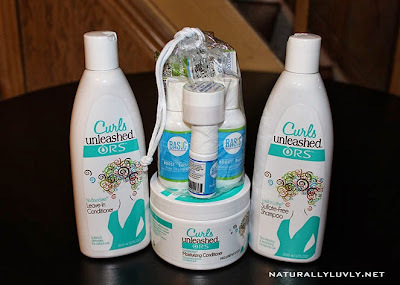 I'm giving away a sample pack of Basic Hair Care products, and some full size products of Curls Unleashed. You must sign up for email updates of Naturally Luvly. Follow me on Facebook, Instagram, Twitter, and Pinterest. You should leave a meaningful comment on each blog post posted on Facebook from September 23 until the giveaway ends. A meaningful comment means your comment must be related to that blog post to show that you actually read it (2 sentences min.). When the giveaway ends, the person with the most comments will win. Once the winner is selected, I will ask that you send me your address in my email. If you don’t live in the U.S., you will be responsible for the shipping costs. If you are unwilling to pay for shipping, then the next person in line will win the prize. Once you receive your products in the mail, I’d like you to come back to this blog post and let us know your honest opinion of Basic Hair Care and Curls Unleashed products. Note: Please keep in mind that I am funding the shipping of the products for this giveaway unless you live outside of the U.S. Do show your support by sharing this giveaway post on your social networks. Lol you're trying to win? I already won , you just don't know it yet !!! Great! I hope I win, both my daughter's have natural hair and we are trying some new products!! This contest is right on time! I'm so late but I love me some Curls Unleashed and this is a great way to get some. I'm game..is it too late?